My father was the only person in my family who called me Elizabeth – unlike my mother, who never calls me Elizabeth. Although she denies it, I believe she picked that for my name so she could call me Betsy. With Dad gone, the only people who call me Elizabeth are people who don’t know me, mainly telemarketers. The tale of how my father’s parents met is one of my favorite family stories. In 1932, my grandmother, Georgina, drove up to see the nearby Lake Placid Winter Olympics with her fiancé, a successful doctor. My grandfather, Clarence, was a handsome mounted New York State Trooper directing traffic at the games. Georgina’s future changed that day and she married the handsome State Trooper, not the successful doctor. Georgina gave birth to twin boys named David and John. Although David, my father, was the smaller, weaker twin, it was John who died the day after they were born. David was a scrappy survivor from his very first year, most of which he spent in the hospital. Dad grew up in rural northern New York, near the Canadian border, during the Great Depression. He worked hard – bailing hay and milking cows on a farm. He had many friends and stayed close to them all his life. He loved animals, especially his dog Mitzi. But probably most of all, he loved his mother’s home cooking. Georgina was a gifted cook and baker who expressed her love with food. She indulged her only child with large home-cooked meals that included donuts, cookies, and other treats. My parents first met as children at St. Mark’s Episcopal Church in Malone, New York where my mother, Joan, was in the choir and David was an altar boy. They re-discovered each other as adults and got married soon after they started dating. After being spoiled with food as a child, it isn’t surprising that my father constantly battled his weight as an adult (earning him the family nickname “Big Dave”). Despite his doctors’ stern warnings, he continued to gain weight until he was diagnosed with diabetes in his 50’s. By the time he reached his 70’s, he also had high blood pressure, congestive heart failure, partial kidney failure, and the beginning of Parkinson’s disease. In addition to his many other serious health problems, Dad developed MRSA (antibiotic-resistant staph) following a knee replacement. Despite aggressive treatment, the infection continued to get worse and the doctor finally recommended amputating the leg. As a runner, the idea of losing a leg was especially scary. Runners are obsessive about our legs. Ask any runner about their legs and you’ll get an extensive list of aches and pains. There’s always something – from tight quads and hamstrings, to sore knees, to shin splints. We baby our legs with foam rollers, massages, ice baths (the REALLY dedicated runners) or warm Epsom salt baths (me). I was shocked to hear that my father was losing his leg – it seemed like such a drastic step. At the time, I thought losing a limb was the worst thing that could happen to someone. The day before surgery, my Mom, sister Jill, brother Doug and I visited Dad in the hospital. We tried to stay positive and cheerful for his sake, but there was no denying how serious the surgery was when Dad was asked to mark the leg that would be removed. The next morning, my normally talkative father was quiet when we kissed him goodbye before they wheeled him into the operating room. After several anxious hours, we were called in to meet with the surgeon, who told us Dad’s leg was in worse shape than they expected. Rather than removing the leg just above the knee, which was the original plan, they had to remove it mid-thigh. His veins were so deteriorated that the surgeon warned us Dad might end up also losing his other leg. Dad recovered from the surgery, but didn’t actually walk again. His weight and lack of fitness made walking with a prosthesis unrealistic. Always an optimist, he gamely attempted it several times, whenever a well-intentioned physical therapist would promise Dad they’d be able to get him walking. He’d be fitted for yet another “miracle” prosthesis and begin the process of trying to walk on it, without success, until, exhausted and discouraged, he and the physical therapist finally gave up. But Dad got around fine with his scooter, which he drove like a race car. Scooter-created dents and dings covered the walls of my parents’ house and Mom’s car doors. In their gated neighborhood, he rode his scooter to the sandwich shop and to visit neighbors. Occasionally, with the hilly terrain and his need for speed, the scooter tipped over and Dad fell out. He needed stitches for a gash to the back of his head after one particularly nasty fall. But even that didn’t slow him down. What I learned from my father’s experience was that losing a leg wasn’t the worst thing that could happen. I learned my father was not only a strong person, but also a resilient person. Seeing those qualities in him inspires me when I deal with life’s challenges. Life will always present challenges, and he showed me that we need both the strength to push through them and the dignity and grace to move beyond them. Dad still enjoyed the same things he had always enjoyed – tinkering on his computer, dining out with friends, and watching John Wayne movies. He still loved Mom, his children and grandchildren, the U.S. Army, his friends, and his cat, Lucky. Although it was a challenging time, the loss of Dad’s leg gave us opportunities to create wonderful memories together. 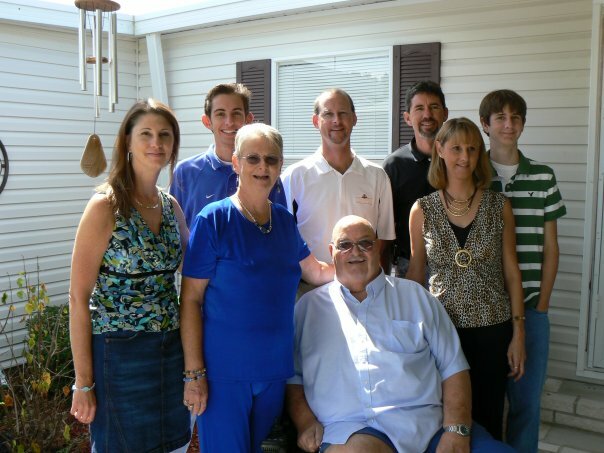 One of our favorite family memories is of the big 72nd birthday party we threw him – probably the only birthday party he ever had. He rolled around the room grinning from ear to ear, excited to see all the guests who were there to celebrate this milestone with him. Near the end of his life, Dad’s health declined and he spent his last months in a nursing home. One day, he informed Mom he was going home. He wasn’t able to get out of bed, so Mom asked how he planned to accomplish that. “On my own two feet, of course!” he replied indignantly. At the end, he didn’t remember his leg was missing – he was still the same person he’d always been.